President Donald Trump says he will fully enforce the sanctions being reimposed on Iran as a result of the US withdrawal from a 2015 nuclear deal. Measures targeting Iran’s automotive sector as well as its trade in gold and other key metals will take effect from 00:01 EDT (04:01 GMT) on Tuesday. 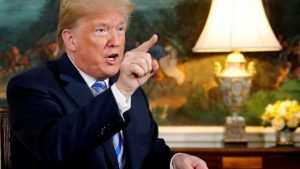 Mr Trump believes the economic pressure will force Iran to agree to a new deal and end its “malign” activities. Iran’s President Hassan Rouhani said the act was “psychological warfare”. Responding on Iranian state television, Mr Rouhani rejected the idea of last-minute talks. “We are always in favour of diplomacy and talks… but talks need honesty,” he said. Mr Trump warned that individuals or entities who breach the sanctions risk “severe consequences”. The UK, France and Germany – which were also parties to the 2015 accord along with Russia and China – have expressed “deep regret” at the US move. They have pledged to abide by their commitments under the deal. Iran has said it will also do so if it continues to receive the economic benefits. Why did Mr Trump abandon the nuclear deal? Former US President Barack Obama insisted that it would prevent Iran from developing a nuclear weapon and that the world would be safer as a result. But Mr Trump said it was a “horrible, one-sided deal”. He declared that its so-called “sunset clauses” – under which the limits on Iran’s nuclear programme will start to expire – were unacceptable; that it did not deal with Iran’s ballistic missile programme; and that it failed to stop Iran’s “malign behavior” in neighboring countries, including Syria and Yemen. “I am pleased that many international firms have already announced their intent to leave the Iranian market, and several countries have indicated that they will reduce or end imports of Iranian crude oil,” the president said in a statement. There was no immediate response from Iran, but Foreign Minister Mohammad Javad Zarif earlier said the US was being “isolated”. He added that it was hard to imagine negotiating with someone who had torn up an agreement that had taken so long to reach. “Who can believe Trump is serious about talks?” he asked. The British, French and German foreign ministers issued a joint statement with the EU’s foreign policy chief saying the nuclear deal was working and was “crucial” for global security. They also unveiled a “blocking statute” that will seek to protect European firms doing business with Iran against the impact of US sanctions. However, an unnamed senior Trump administration official said the US was “not particularly concerned” by the move. The official noted that Iran had already suffered severe economic difficulties since the US abandoned the nuclear deal in May, with the rial losing almost 80% of its value.